For too many homes, sagging gutters are an inevitability. But what a lot of homeowners don’t realize, is that breaking down gutters do more than detract from the appeal of their home — they can lead to water damage. The SnapLock Gutter System® was created to counter this, to provide a run-off system for homes that won’t, over time, cause damage itself. SnapLock Gutter Installation® eliminates failures due to water damage typically associated with conventional gutter installations. SnapLock Gutter Installation’s innovative “No-hole” technology uses no spikes or nails for attachment to your roof line. There is no need to penetrate the front or back of the gutter. The result is a watertight mating of the gutter at the edge of your roof. A seal that prevents seepage, rust, rot and mold. Further, because the integrity of your gutter channel is not riddled with holes, the SnapLock Gutter Installation dramatically outlasts all traditional rain gutters while protecting your home against the hazards associated with bacterial mold and fungus. Another major benefit of the SnapLock Gutter System® is that it allows the gutters to move freely. This can be crucial when attaching metal to any structure, due to the different rates of expansion due to temperature change. Even better, the system can be installed on nearly any home. The system is designed to work with the most common gutter sizes, meaning that the system looks like any other home– except the gutters don’t sag. SnapLock can fit almost every fascia-roofline configuration, meaning that anyone can have a structurally sound gutter system that doesn’t rot their home. The SnapLock Gutter System® is an affordable gutter system solution that can save homeowners an incredible amount of money over time. While gutters themselves are very sturdy, it’s not uncommon to quickly see rotting fascia boards. With SnapLock, this worry is eliminated, making the gutter system far more permanent, and better for the home. 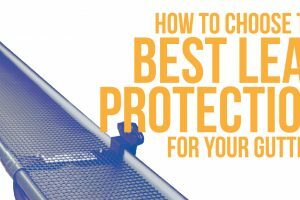 The price of new gutters is much more easily justified when you know that you chose the best: the long-lasting, high-quality, cost-effective SnapLock Gutter System® that will stand the test of time.